Hiking trail DE Delaware MD Maryland PA Pennsylvania. 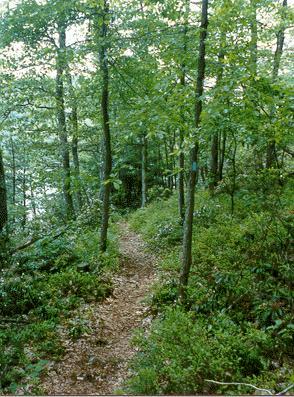 The Mason Dixon Trail System connects the Appalachian Trail with the Brandywine Trail near Chadds Ford, PA.
the blaze to the right. Need maps to find your way and know were your going? Link To the OFFICIAL Mason Dixon Trail System Website! "This York Hiking Club page"
to give you sample idea were and what the trail is. 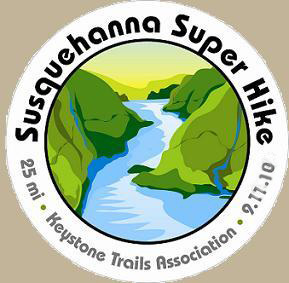 Susquehanna Super Hike & Ultra Trail Run (York & Lancaster Counties): The Keystone Trails Association will host the second annual Susquehanna Super Hike & Ultra Trail Run on Saturday, September 11, 2010. Join KTA for the 28.4-mile trail challenge for adventurous hikers and trail runners on the wild river hills of the lower Susquehanna Gorge. The course follows the Mason Dixon and Conestoga Trails and features spectacular river views including Urey Overlook, House Rock Vista and Pinnacle Overlook, scenic hollows like Oakland Run, Tucquan Glen and Kelly’s Run, and Wind Cave, one of the largest tectonic caves in the eastern U.S. Longest Day 100K Challenge: June 20, 2009 - 100 kilometers in 15 hours of sunlight on the longest day of the year. Sunrise 5:37, Sunset 8:38 (total time 15:01). Susquehanna Park, Maryland to Long Level, near Wrightsville, Pa Start at sunrise (05:37) finish by sunset (20:38), total time: 15:01. This 100K trail run has been run for at least three years making the MDTS part of "Trail Running Clubs" scheduled events for the year. They write about how the York county part of the trail is: "The route is along the most beautiful part of the Susquehanna, and the wide variety of terrain and landscapes is unbelievable!" Organized by: Official Website. Photos1 , 2 (Just click next top/right). York Daily Record: "Fastest time on longest day"
"Pfleiger said the course follows the Mason Dixon Trail near the Susquehanna River, and it is mostly single track. It also gets more and more difficult toward the finish. This year's event, the third annual, was made more challenging by Mother Nature." Highpoint: York Hiking Club helped reroute a portion of the Mason-Dixon Trail off a busy road and onto Highpoint, county-owned property in Lower Windsor Township. Mason-Dixon Trail Murphy’s Hollow Relocation: Thanks to Ed Kline of County Line Quarry, we received permission to move the Mason-Dixon Trail off of a very dangerous part of Rt. 624 just down river of Wrightsville. This area is called Murphy’s Hollow. The trail now crosses Safe Harbor and County Line Quarry property. Hike Safer with this relocation information. MORE INFO CLICK. Volunteers moved part of the nature walk off Route 624 onto safer land. A small group of seniors Wednesday said opening their hearts, giving their time and digging in the dirt keeps them appearing and feeling young. The volunteers, all of whom are retired, worked to clear about a mile of path for a hiking trail to be moved to a safer location. MDTS at Muddy creek at Paper mill road in lower Chanceford twp. we parked our vehicle on edge of road, peach bottom twp side. ........ MORE INFO CLICK. people to call ahead if they are going to hike the part of the MDTS that is on Peach Bottom land. They are to call (717/456-4212) ........MORE INFO CLICK. Shank's Mare at Long Level south of Wrightsville has the maps. Also in the E-Store. Otter Creek Camp Ground is now selling MDTS maps. www.ottercreekcamp.com . The 2004 edition of the M-DT maps is now available. The maps have been updated; GPS data has enabled more accurate delineation of the M-DT, there have been many relocations, other trails have been added. Each map, printed on water-proof paper, is 20 x 8.5 inches and folds to a 4 x 8.5 inch format. A detailed trail description, both west to east and east to west, is printed on the reverse side of each map. The set of 10 maps includes a cover sheet and is enclosed in a plastic bag. The new maps include side trails and park trails shown as dotted red lines in addition to the solid red line of the M-DT. 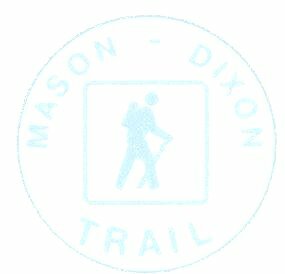 Link To the OFFICIAL Mason Dixon Trail System Website. Please join the Mason-Dixon Trail System and get a map set and a patch. The guide book is on the back of the maps. The 190-mile long Mason-Dixon Trail starts at Whiskey Springs, on the Appalachian Trail, in Cumberland County, PA and heads east towards the Susquehanna River, passing through Pinchot State Park en route. The trail then follows the west bank of the Susquehanna south to Havre de Grace in Maryland. Across the river, the M-DT continues east, passes through Elk Neck State Forest, then on to Iron Hill Park in Delaware, north along the Christina River and White Clay Creek to the White Clay Creek Preserve. The trail then heads northeast to its eastern terminus at Chadds Ford, PA on the banks of the Brandywine River. Pinchott State Park: Click Below. Susquehanna State Park: Click below to go there! Elkneck State Park: Click below to go there!